Fr Jason Middleton: “The Clergy Sustentation Trust Fund helps to ensure that this parish can maintain a fulltime priest and have other services that city parishioners are used to”. FATHER Jason Middleton was driving on a dirt road with a mobile phone that teased: “No service”. He was heading to a cattle property on the remotest stretch of the Brisbane archdiocese. Roads of dirt, cattle grids and not one bar of mobile phone reception. From the property, Fr Jason would see the unremarkable point where the Brisbane, Rockhampton and Toowoomba dioceses met. What was a city boy doing here? 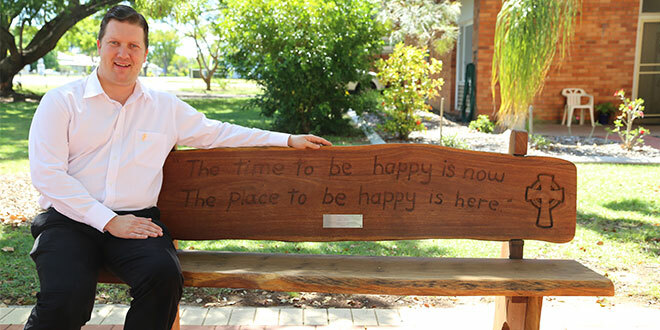 “I was invited by this lovely Catholic family to visit their property – I had only just started as the parish priest (of Gayndah) and it was quite a trip for someone like me,” Fr Jason said. “I must admit – I’ve never even changed a tyre. And they’re not the roads you want to drive when you’ve never changed a tyre. But, luckily, everything held together that day. Gayndah is one of Queensland’s oldest Catholic communities. It was well established by the time Archbishop James Duhig dedicated St Joseph’s Church three days after the Anzacs landed in Gallipoli. The parish now takes in Eidsvold, Mundubbera and surrounds. And Fr Jason says the community owes a lot to the Clergy Sustentation Trust Fund. Without the fund, Fr Jason knows that his life in the parish would be different. “We’re a relatively small parish but we’re so large in area. In the 2011 census, our parish included 873 registered Catholics,” Fr Jason said. “Add to that statistic the reality that many of the families of our parish are farmers, orchardists and graziers. Such work is unpredictable at best and in the previous years we have suffered through two floods. “Yet, the people of this parish deserve a priest and a living parish like any parish that has more resources and more people. The Trust Fund is supported by parishioners across the Archdiocese – its only source of income is a levy of three per cent of all Mass collections. The Fund’s chair, Fr Mark Franklin from Noosa District, said: “Parishes that demonstrate they are not able to totally fund the sustentation needs of their priests are able to seek financial support from the Fund”. The Fund, which operates on behalf of Archbishop Mark Coleridge, also supports chaplains in ethnic communities, tertiary institutions, hospitals and prisons. “I wish to express my sincere appreciation to all who make it possible to continue these ministries through Mass contributions,” Fr Mark said. The Gayndah parish is a lively example of the benefits of the Trust Fund. As Fr Jason sits outside the 100-year-old church on a warm afternoon, locals wave as they walk along Meson St past the well-presented St Joseph’s primary school. They stop for a chat beneath the trees that shade the entrance to the loved church. The conversations are diverse – comings and goings in the community, who went where for summer holidays, hopes for 2016 – but they all have one important link: the ability to engage with a fulltime priest. “It is a great community here, people really do rally around one another, support one another and actually get to know one another,” Fr Jason said. Fr Jason sees plenty of the parish. Like other priests, his weekend is planned around Masses in different towns. The weekend begins in St Patrick’s, Eidsvold, with a 4.30pm Mass on Saturday. Fr Jason ends the liturgy in time to return to Mundubbera for a 6.30pm Mass. Sunday morning Mass is at Gayndah followed by baptisms. Then it’s off to the nursing home for visitations and to bring the Catholic residents Holy Communion. “I also travel to Mundubbera regularly on a Wednesday for an evening mass before which I do visitations there also,” he said. Archbishop Coleridge accompanied Fr Jason on the weekend journey last year as Gayndah celebrated the 100th anniversary of its church. “We fluctuate with the numbers of people at different times of year. We get a lot of fruit pickers through the towns, both in Mundubbera and Gayndah and some in Eidsvold,” Fr Jason said. Gayndah was to be anything but rural – the town was established in 1849 and its post office set up the following year. There was talk of Gayndah becoming the state’s capital, with the promise of the Burnett River and its agricultural and grazing benefits luring European settlers away from the Brisbane convict colony. Brisbane won out but Gayndah remains rich in heritage-listed sites that underline the town’s important historical role. Fr Jason is approaching his third anniversary in the parish and says the experience has meant much to a priest raised in Brisbane. “There are different expectations on the priest in a parish like this,” Fr Jason said. “They are much closer to the people because there aren’t the support staff that are often found in city parishes. “So you do find yourself doing a lot of things around the parish. It’s a great time because you get to understand all of the things that go into making pastoral ministry viable and fruitful. “And it’s a wonderful experience to encounter people in different lifestyles. “Those people whose weekly donations go into the Clergy Sustentation Trust Fund should know that their generosity helps to keep parishes like Gayndah alive and vibrant”.